Guest blog post by Murat Muftari, International Trade Specialist, International Trade Administration’s U.S. and Foreign Commercial Service. Muftari also is a former U.S. Special Forces soldier. This post contains external links. Please review our external linking policy.This post originally appeared on the Department of Commerce blog. “History has shown that when you give veterans an opportunity to succeed, they go above and beyond. And we as a nation owe them those opportunities to succeed,” said Secretary of Veterans Affairs Robert A. McDonald when recently announcing the expansion of the Veterans Economic Opportunity Initiative – a collaborative initiative to increase economic opportunities for veterans. As we approach Veterans Day this Wednesday, November 11, let us take a moment to honor America’s veterans for their sacrifice and willingness to serve for the common good of a grateful nation. Their service continues well beyond the battlefield and into the commercial and private sector where transitioning veterans continue their mission and turn to entrepreneurship at greater rates than the rest of the U.S. population. In fact, more than 2.4 million U.S. businesses are owned by veterans, representing about nine percent of all American firms and employing an estimated 5.8 million workers, with $1.22 trillion in sales receipts. Our veterans are significant contributors to America’s global leadership in business and innovation, supporting jobs and furthering our national security. Although veteran-owned firms (9.9 percent) are less likely to export than minority firms (17.5 percent) and women-owned firms (12.1 percent), veteran-owned firms that do export are often bigger and have more employees than other firms that export. Veteran-owned firms employ an average of 68 employees, compared to 42 employees for women-owned firms and 21 employees for minority-owned firms. Since only 9.9 percent of veteran-owned firms export, the Department of Commerce sees this as a tremendous opportunity to assist and increase the amount of veteran-owned firms that export through the Vets Go Global initiative, translating to an increase in bottom-lines and jobs. Providing customized export counseling on the frontlines of veteran-owned business events. This is happening next week at theNational Veteran Small Business Engagement (NVSBE)Conference in Pittsburgh, Pa., November 17-19, where the Vets Go Global team will be exhibiting and engaging with veterans through a seminar and one-on-one counseling opportunities. Collaborating and working with theVeteran Institute for Procurement (VIP) to put together an international business curriculum for veteran-owned businesses. Veteran-owned businesses who graduate the three-day program will then have an opportunity to develop an export strategy and write an export plan for international markets through a veteran focused ExporTech, an export acceleration system for achieving profitable growth. Our team is also working with veteran-focused business associations that will lead trade missions to markets in Latin America and Asia focusing on industry sectors that show the most significant trends for opportunity in these markets. The mission destinations and targeted industry sectors are based on ITA’sTop Markets Series, which is designed to help U.S. exporters identify their next export market by comparing opportunities across borders. Our Vets Go Global team will continue to collaborate with private and public organizations that offer resources to veterans by presenting additional avenues of economic opportunity to veteran-owned businesses. Our team calls on the veteran-owned business community to continue to rise to the occasion when opportunity knocks and go above and beyond by joining Mission Global and learning more about the existing export opportunities and resources. 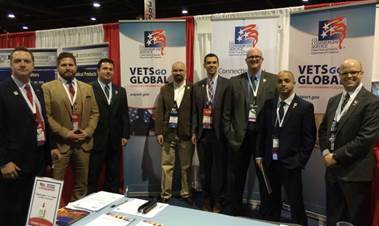 To get started, contact the Vets Go Global team at vets@trade.gov or contacting your nearest Export Assistance Center. As Veterans Day approaches, I would like to personally thank the brave Americans who have served – as well as their families – and those who continue to serve our country as members of the Armed Forces. Follow the Vets Go Global team on Twitter and join our Vets Go Global LinkedIn Group Page for news about upcoming initiatives!